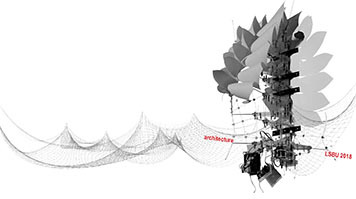 Our exhibition in the Keyworth Centre showcases the creative outputs of the entire architecture programme at London South Bank University, with BA(Hons)Architecture and MArch: Master of Architecture students displaying a range of speculative and innovative ideas about architecture. LSBU architecture has its roots in Borough Polytechnic and the Brixton School of Building, and proudly reflects the idea of a school of architecture operating to achieve a sustainable built environment in the context of central London. There remains a strong ethos of engagement with the communities around the university in both south and north London, and an emphasis on projects reimagining the form, composition, and operation of London’s architecture, underpinned by contemporary precepts of intelligent digital design - and creative approaches to energy and resource efficiency. Students are particularly encouraged to consider architecture as a cultural art, with emphatic social purpose.